France is the country with a very rich and complicated history. Its symbols changed many times, but the main colors – blue, white and red – were constant “companions” of french people. The resulting tricolor has become a real visual incarnation of the famous slogan: "Freedom! Equality! Brotherhood!". Since then, red symbolizes the flame of French people's hearts, white is associated with a national heroine Jeanne d'Arc, and blue - with St. Martin of Tours, who, according to ancient tradition, gave his blue cloak to a beggar. Is the idea of freedom, equality and brotherhood also close to your heart? It may find its reflection even in dog accessories you purchase for your doggy! For example, this Leather Dog Muzzle with picture of Flag of France is exactly what you need to show your heart disposition to the French people and their ideals. 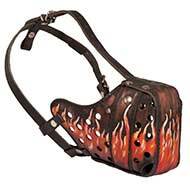 Hand-painted leather dog muzzle will undoubtedly attract people's attention and even admiration. The paint our craftsmen use is waterproof, so it does not fade, nor does it rub off with time. 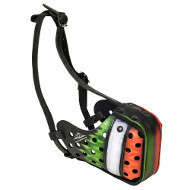 The muzzle has an ergonomic design, allowing your pet to get lungefuls of fresh air at walks or training sessions. 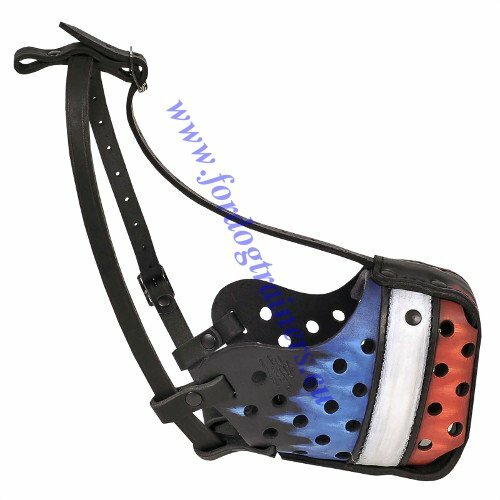 You can adjust the muzzle easily with the help of soft leather straps. 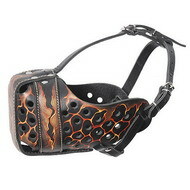 All the parts of this Luxurious Leather Dog Muzzle for Agitation Training are non-toxic; they are stitched and riveted, thus making the product almost unbreakable. 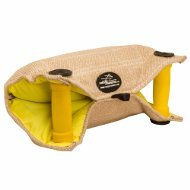 Besides, thinking about your dog's comfort and safety, we've padded the muzzle with thick felt, and have put a steel leather covered bar to protect the nose from injuries. 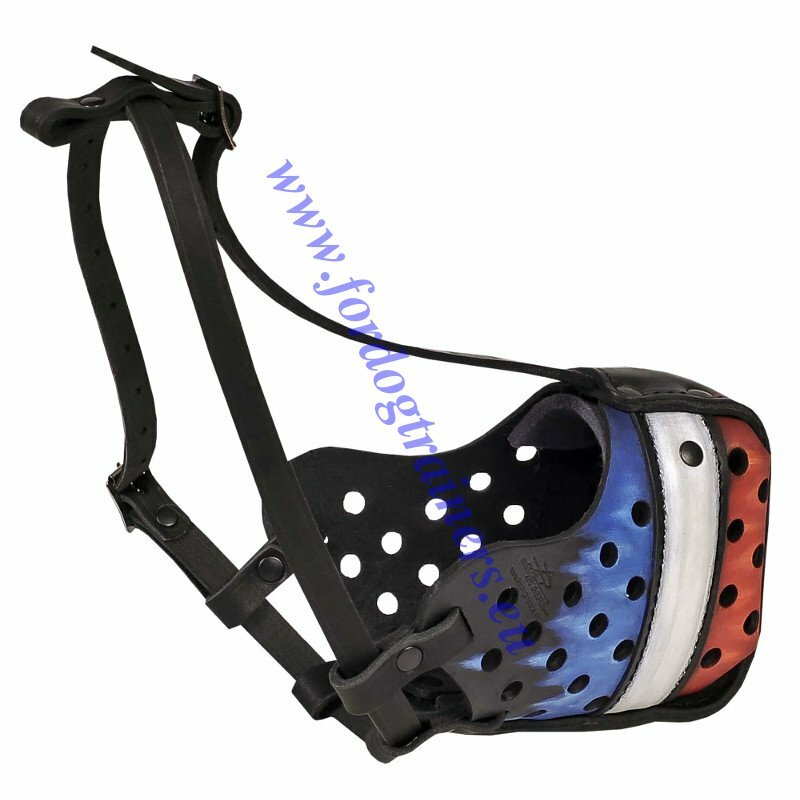 Because of all these “small” details, our Painted Dog Muzzle with French Flag on it keeps well its shape, can be well adjusted, is comfortable and rather durable. The best investment is an investment into your dog's health and comfort, so do it with this “F.E.B” Incredible Painted Leather Dog Muzzle! 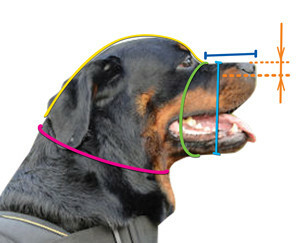 In order your dog to feel maximum comfort the muzzle can provide with, measure your dog carefully to get the needed size. 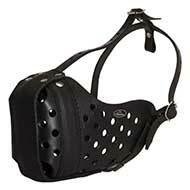 Never leave your doggy unattended while muzzled. To prolong the product's life span and to keep it in excellent condition, please, polish it with water repellent and use leather balsam. 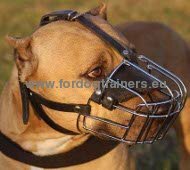 See other Leather Dog Muzzles, Luxurious Leather Dog Collars, Excellent Training and Walking Harnesses and other outstanding products for your dog in our on-line pet store!